This week oil markets hit the “undo” button and reversed all of 2018’s gains to date. Where January brought stock draws and strong economic growth projections, February so far has delivered rising inventories and some of the largest single-day stock market losses in history. Is this the reversal we’ve been waiting for so long? Or is it merely a correction as the market rises higher? It’s too soon to tell if this week’s data is a mere interruption or a new trend. A few trends suggest that, at least until spring, prices could remain at current lower levels. Brent-WTI spreads, the difference between international Brent prices and U.S. WTI prices, has fallen below $4 recently. Although new infrastructure to the Gulf Coast makes it cheaper to export than it used to be, sub-$5 spreads reduce arbitrage opportunities, dampening the call for U.S. exports. That will help keep inventories in the U.S., meaning more crude being placed in inventories. Another important statistic, 3:2:1 Crack Spreads, fell below $16 this week. The crack spread is a rough estimation of refiners’ margins, representing the market profit from refining three barrels of crude into two barrels of gasoline and one barrel of diesel. Spreads have been narrowing slowly since September, but only in the last few weeks have they fallen below historical averages of roughly $17/bbl. Lower 3:2:1 spreads indicate that refiners have less incentive to produce refined fuels, meaning less crude will be pulled from storage to be converted. 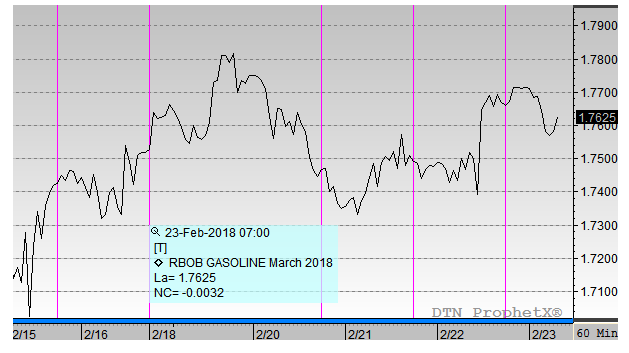 I say prices could stay this level until spring because that’s when refinery maintenance ends and consumer demand picks up. Spring isn’t far away, so take advantage of lower prices while you can. Markets still have a price structure that incentivizes suppliers to empty their inventories, which means supplies should remain tight. Once demand returns, expect prices to rise rapidly, closing the window of opportunity to lock in lower prices. As we noted above, prices have fallen rapidly this week. Part of the struggle for crude markets was pressure coming from a rising dollar and threats of future interest rate increases. A stronger dollar creates headwinds for oil prices, since the dollar is the main currency backing oil markets. As the economy strengthens and the Federal Reserve increases interest rates, oil prices could take a hit. At the same time, large stock builds this week and last ended the long string of inventory draws stretching back to November, which has rattled market confidence. Prices began the week above $65/bbl, and rose to a peak of $65.40 this week before beginning the precipitous decline. Today’s opening price of $61.70 marks the lowest crude opening price since early January. Of course, just a few months ago, prices above $60 would have been considered a shock; now, it’s a nice reprieve from the extremely high prices seen in the last few weeks. Since peaking on January 29, crude prices have fallen 8.2%. Diesel’s decline has been precipitous, dropping rapidly below the $2/gal level. For weeks, diesel prices have been elevated above $2/bbl, which many commentators believed was too high relative to crude’s level. While crude has been falling 8.2%, diesel has been falling much faster, giving up 11.4% in the past 1 ½ weeks. Diesel prices began the week at $2.0450, down slightly from their highs last week. Prices have fallen non-stop since that opening price, reaching a low point today at just over $1.90. Falling fifteen cents in a week, diesel prices are now a better value relative to crude oil. Gasoline prices have also fallen more than 10% since peaking last week, with prices falling this week from $1.87 on Monday down to $1.75 today, a 12-cent loss. With seasonally weak demand and low refinery through puts currently, gasoline markets are not looking to make waves. Like other products, gasoline inventories rose this week, which has kept downward pressure on prices.